Fashion's Sense: Can #InstaNatural Dual Phase Mattifying Toner Leave You Shine-Free All Day? Can #InstaNatural Dual Phase Mattifying Toner Leave You Shine-Free All Day? Hey lovelies! I am back with another product review. This time I am reviewing a facial toner that claims it can tone and mattify, leaving your face shine-free throughout the day. Let's see if InstaNatural's Dual Phase Mattifying Toner lives up to this claim? What Does Dual Phase Mean? "Dual phase refers to the two distinct states of matter that exist in this unique formulation. Without the addition of emulsifiers, the natural clays separate from the liquid and fall to the bottom of the bottle. When shaken, this suspension works to absorb oils while naturally toning the skin in one quick and easy step." So, I get the explanation. However, it still feels gimmicky to me. Anyone who looks at the product knows it has ingredients in it that are separated and need to be mixed together by shaking for each use. Using the buzz term "dual phase" makes it seem like it is doing more than mattifying and toning. That is just my take on it. How Do You Use This Toner? 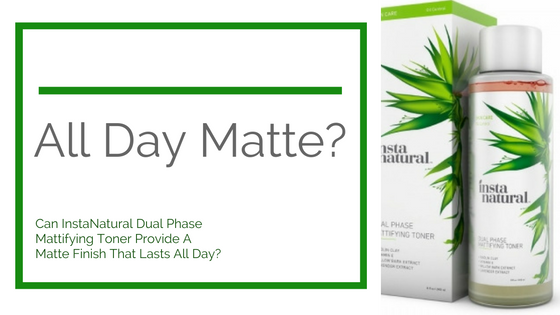 You do not use InstaNatural Dual Phase Mattifying Toner like you do most toners. First, you must shake it to mix the kaolin (natural clay) and the toner together. Next, you pour a quarter-sized amount of the mixed toner into your hands, and press the toner into your skin. Then you follow with your moisturizer. How Effective Is the Mattifying Action? After you press the toner into your skin, your face is instantly matte. For my face, the toner only kept my face matte for about two hours. This was the same whether I followed with a moisturizer or not. I am 39 with combination skin that is also acne-prone. I am also in that hormonal time of the month, so my oil-production is slightly increased. Even with that, since the toner is for combination, oily, and acne prone skin, it should have kept my face shine-free for longer than two hours. Is This Safe for Sensitive Skin? I would have to say no. Certain areas of my face stung when I applied the toner. When I waited to apply the toner five minutes after washing my face, it stung a little. When I applied it a minute after washing my face, the areas around my nose, my eyebrows, and my chin felt like they were on fire for a few minutes. I honestly cannot recommend this for sensitive skin types. I was not happy with this toner's results for my face. To go through any type of pain and then only have the product work for a couple of hours, is disappointing. There is a bright side. This month, my area had a week of Indian Summer. That brought out a few mosquitoes that bit my arm. I had two red, swollen bites on my arm that itched like crazy. I applied the toner to the bites and the itching stopped. The redness and swelling went down as well. I applied it to that area twice a day and the bites gave me no more discomfort. This toner failed me for use on my face. As a first aid for insect bites, this toner scores well for me. Overall, I give it a C. It gets a C because it did not perform as it was intended. However, I found a new use for it that the company may want to consider. Just because this product did not work for me, does not mean it won't work for you. We are all different. So, if you are interested in purchasing this toner it costs $15.97 and be found at Amazon and InstaNatural's website.